I enjoy traveling through William Russeth’s blog as an armchair tourist when he takes us to ancient sites via photos of structures and stories of their uses. That I write books and articles on historical buildings in the state of Texas, U.S.A. might seem laughable by comparison. 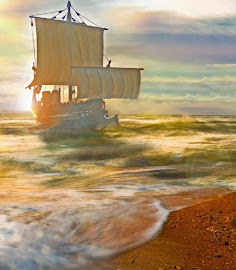 Our civilization is too wet behind the ears to have a long history. Texas didn’t become a Republic until 1836 and then a state in the U.S. in 1845. Even the few Spanish Missions that Texas inherited are young by European standards. As for ruins left by Native tribes, while there are wonderful examples in other states, Texas’s original inhabitants were mostly nomadic rather than builders. My goal in writing about our oldest buildings is to keep “progress” from tearing them down by recording what happened there. Coliseums? No. Owners regularly tear our sports arenas down to build “state-of-the-art” structures every few years. As soon as our founding fathers established a county seat, a lockup claimed top priority, sometimes even before the courthouse (or inside it). Early Texas methods for incarcerating criminals sound extreme and inhumane by today’s standards, but few law-abiding citizens lived much better themselves. They simply did the best they could. The first jail may have been little more than a chicken coop, but subsequent buildings remain today as architectural and historical attractions. Why are so many of these structures beautiful as well as strong? Historians I interviewed point out that builders took pride in the appearance because these symbols of authority had to excel in strength and were meant to stand for generations. Considering the measures employed to make them escape proof, demolition of the buildings might wear out a wrecking ball or two. At least one jail laced its outer walls with small cannon balls mortared between the stone blocks, and others used steel pins. Other ingenious systems came into use such as metal cages within the walls that could be locked simultaneously without the jailer having to risk going inside. Bars were invented that cannot be sawed through, and jailers devised surveillance devices to observe prisoner activity. Quite a bit of instruction turns up at the museums regarding the correct procedure for death by hanging, and one sheriff drew diagrams to show it. These how-to explanations didn’t result from sadistic preoccupation, but from a genuine concern to make the execution as quick and painless as possible. The expression, “dancing at the end of a rope,” meant the person died of slow strangulation. Why aren’t these jails still employed for their original intention? Because they either cannot be upgraded to today’s standards of comfort and decency, or they pose a threat to the jailers. Unrecognized as the valuable tourist attractions they are, quite a few still stand neglected to the point of ruin, or they become relegated to mere storage facilities. Some have even been destroyed. But thanks to innovative minds with an appreciation for history, the jails featured in my book have realized their potential as town attractions. Aren’t we all curious about the stories those mighty walls could tell? And hearing the stories, don’t we want to see what it’s like inside those walls? How fitting that the buildings which once kept folks safe from outlaws now serve us as museums, libraries, restaurants, hotels or B&Bs. One artist/photographer I know even turned one into a charming home. 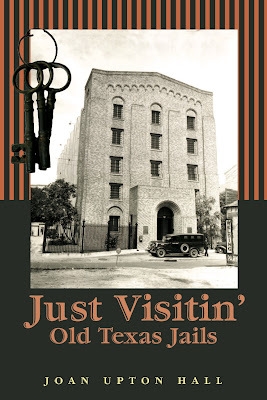 Former jails now open their doors to the public, the oldest dating back to 1850. Just think, at last, you can go to jail and like it! This month I am excited to feature a renowned guest author, Joan Upton Hall. Joan taught English for twenty-eight years, was an editor, and even did some cartooning before becoming a full-time freelance writer. She also instructs creative writing classes, is in demand as a conference speaker, and is active in the San Gabriel Writer's League and Writers' League of Texsas.